Home » Seizures Q&A » What Is Jacksonian Epilepsy? Jacksonian seizures are simple partial seizures that initiates in one of the body parts such as the fingers, side of your face or on the toes of your foot. These jerking movements that are observed in one part of the body usually spread to the other muscles usually in the same side of the body. Jacksonian seizures happen to persons who are associated with lesion or any type of defect in the cerebral cortex area which is responsible to control your voluntary movements of the body. One who suffers from this type of epileptic seizure observes no change in consciousness or awareness. They are usually temporary, transitory and short lived. The above mentioned are some of the most common Jacksonian seizure symptoms. It is often observed that patients who undergo Jacksonian seizure attack usually feel weak after the episode. In some cases it may also lead to paralysis of the body. Jacksonian seizures are most commonly seen in childhood or adolescence. However, it’s not age restricted and can occur at any age. They can come as a single episode or may develop into a repeated and lingering condition that is epilepsy. The physical and neurologic exam conducted to know the findings of Jacksonian epilepsy may be normal. The neurological tests that are usually carried out include tests of reflex, motor and sensory functions. It has been observed from many clinical tests that testing the cranial nerves may provide an accurate point to the affected areas of the brain. These tests can help to find out any kind of movement abnormality or reflexes. Electroencephalogram (EEG) is considered one of the most successful tests in diagnosing Jacksonian seizure symptomsin a person. The reasons for EEG being successful is because these seizures have distinctive findings which are not limited just during the seizure but also between seizure episodes also known as the interictal phase. EEG usually shows an abnormal brain wave pattern, a main characteristic of a seizure finding. To get a more detailed analysis of this seizure, routing imaging tests for example MRI, CT scan or x-ray visualization of the nerves of the brain can be used to detect brain lesions which are mainly responsible for this seizure. The Jacksonian seizures as we know involves the uncontrolled contraction and sudden relaxation of muscles which may lead to sudden falls and requires work accommodations to avoid injury. For individuals suffering with this type of seizure activity requires special precautions especially when the seizures they are having are of recurring nature. So driving a car alone or with others is not acceptable unless and until you are seizure-free for at least 1 year. 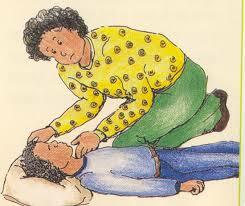 To help someone with Jacksonian seizure, you can follow the first-aid for seizures by clicking here. Also, browse through our website to find out to help someone having a diabetic seizure and with other types of seizures.